See Oakdale and Tracy Bypass for ways to get around towns like Tracy, Manteca, and Oakdale in bad traffic. The only Sno-Park I'm aware of on Hwy 108 is officially called the Hwy 108 Sno-Park. It is 7.7 miles east on Hwy 108 from Strawberry, at 5900' elevation, where the highway is gated in winter. You should be able to get Sno-Park permits in the town of Strawberry (waypoint STRAWB, 35 miles east of Sonora Pass) where Hwy 108 crosses the South Fork of the Stanislaus River. There are actually two parking lots near waypoint H108SP. The waypoint is in the main lot, west of the gate, which allows overnight parking with a 3-night limit and has an outhouse. The other lot, east of the gate, prohibits overnight parking. Pikes Peak and Bull Run Rock are a nice day-hike from here, but there are no 'list peaks' in the area. Snowmobiles seem to be the primary users here, on the closed portion of Hwy 108 and on logging roads. There is a pay phone at the intersection of Clark Fork Road and Hwy 108 (waypoint CLARKF). Near this intersection there is a 'camp in designated sites only' sign, implying you can camp anywhere you want west of that intersection. (From Clark Fork to Sonora Pass camping is restricted.) The Clark Fork Campground (waypoint CLARKC) appears to be unmonitored but open in late fall, and is about halfway from CLARKF to the end of the road. The trailhead for Disaster Peak (waypoint DISATH) is where the road ends just southwest of The Iceberg (a prominent rock formation). 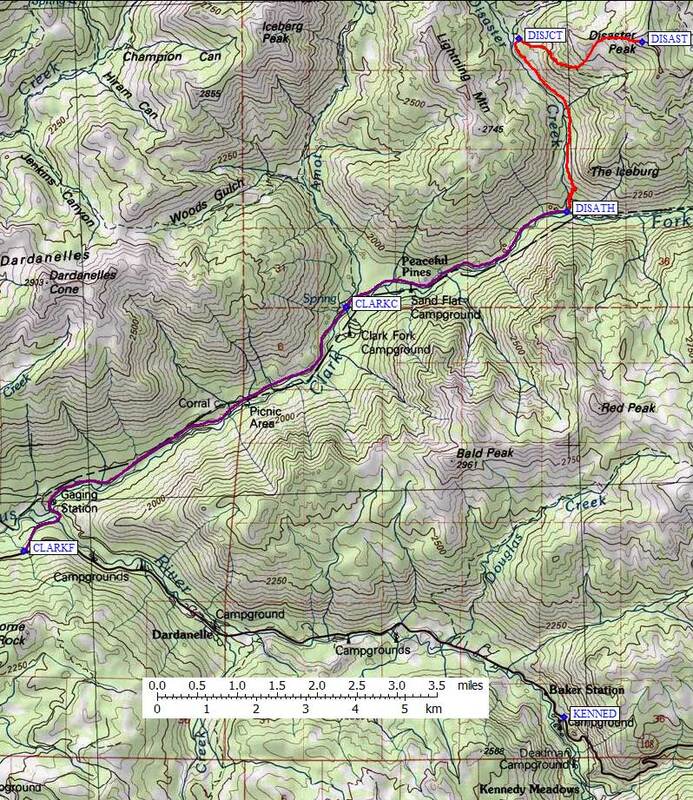 Note the waypoint DISJCT, where a use trail leaves the main trail and heads toward the peak. Many trip reports indicate people have missed this junction on the way in AND on the way out. Don't be fooled by animal and use trails near the summit. 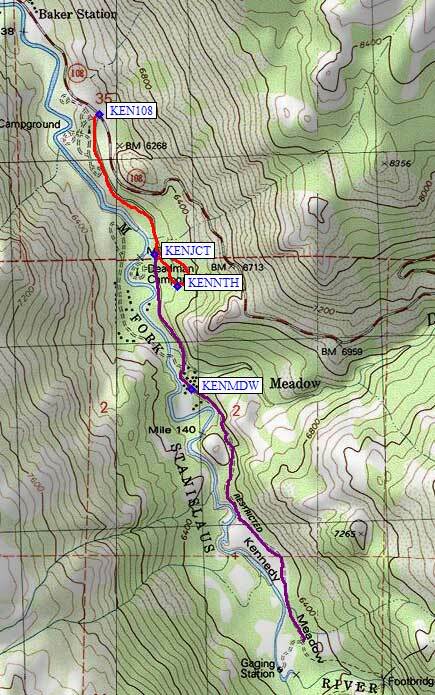 If you're using Kennedy Meadows as a trailhead, make sure you know which Kennedy Meadows. There are two Kennedy Meadows in the Sierra Nevada, hundreds of miles apart. These are the directions for the Northern Kennedy Meadows, in the Stanislaus National Forest Emigrant Wilderness, which is often used as the trailhead for Blackhawk. The southern Kennedy Meadows can be accessed by the Sherman Pass and Canebrake Road driving direction files. The ranger station for this area is in Pinecrest. It opens at 8:00. There aren't any self serve permits, but if you phone them in advance, at 209-965-3434, they have been known to leave a permit for you in their box. From the Hwy 120 / Hwy 108 junction (waypoint 120108), continue on highway 108 past the town of Sonora, Pinecrest, and Dardanelle (waypoint DARDAN). There are seasonal services at Dardanelle, including a gas station, cafe, and a small general store. Kennedy Meadow (waypoint KENMDW) is off Hwy 108, 5 miles beyond Dardanelle, 29 miles beyond Pinecrest, and 56 miles beyond Sonora. Turn south from Hwy 108 at the Kennedy Meadow and/or Baker Campground sign (waypoint KEN108). There is a pay phone right at this intersection. Stay left to avoid the private campground. Continue up the one-lane road to where there is a sign for trailhead parking (waypoint KENJCT, where the red and purple lines meet on the map to the right). Backpackers must park in this large parking lot. There are signs that say you must camp in designated sites and there is a two night limit, so there may be free trailhead camping. A trail leaves the parking lot near the toilet at waypoint KENNTH. A sign there says it's 1.5 miles to the wilderness. The road continues to the Kennedy Meadows Cafe and Pack Station (waypoint KENMDW), which burned down in 2007 and was being rebuilt in early 2008. WARNING: This paragraph was written before the resort burned and was rebuilt. Please let me know whether it's still correct if you visit after the rebuilding is complete! The resort doesn't offer hiker/backpacker parking. After the resort, there is a gate which might be open or might get locked at any time without notice for no apparent reason. You can drive about a mile past the gate to drop off people and packs, but then you should send the driver back with the car. At least one person in the party is going to have to walk the extra distance (roughly the purple line on the map to the right). 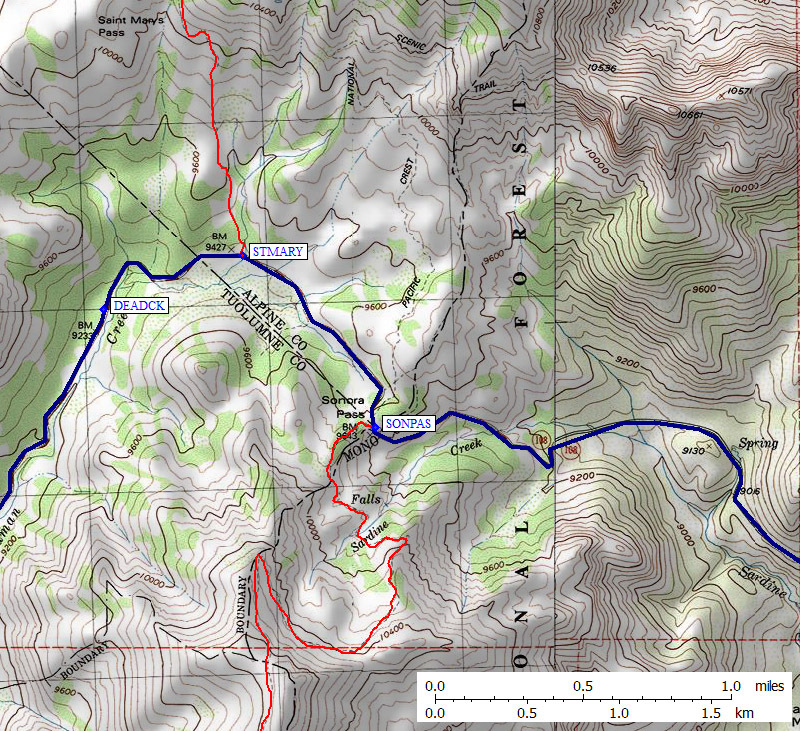 The trailhead for St Mary's Pass (waypoint STMARY) is where many people start for Stanislaus Peak or Sonora Peak. This trail heads north from Hwy 108, less than a mile west of Sonora Pass. 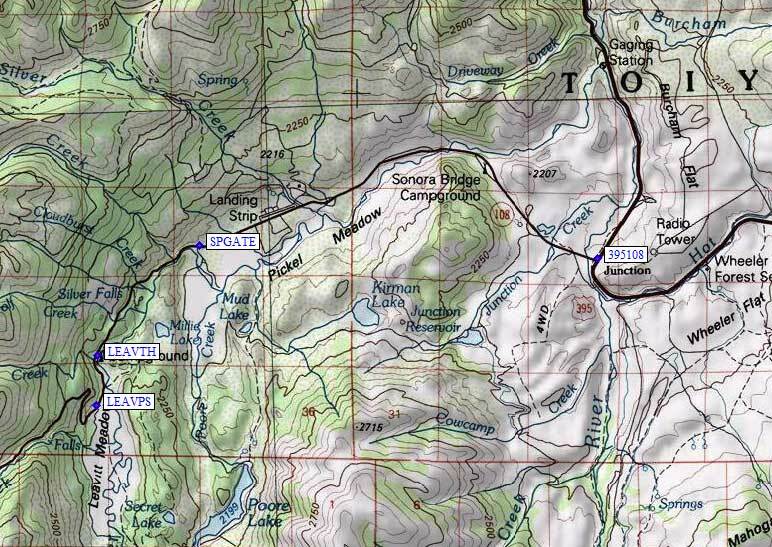 The trailhead for peaks south of Hwy 108 (like Leavitt) is at Sonora Pass itself (waypoint SONPAS). There is no parking exactly at Sonora Pass, but about 0.1 mile west of the pass there is a small paved road that leads up and east to some picnic tables with a great sunrise view, an outhouse, and parking. 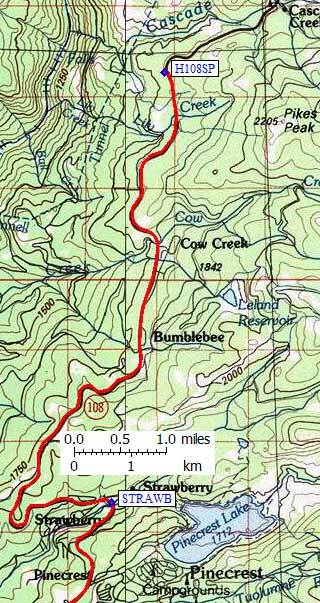 This is where the Pacific Crest Trail crosses Hwy 108. Leavitt Meadow is the flat spot at 7000', above and west of the Marine base but below and east of the steep grades (marked 12%) so commonly associated with Sonora Pass. There is a gravel parking lot on the north side of Hwy 108 near the pack station (waypoint LEAVPS). If you park here (where there are no signs allowing or disallowing parking), you'll have to cross the river several times while crossing the meadow. 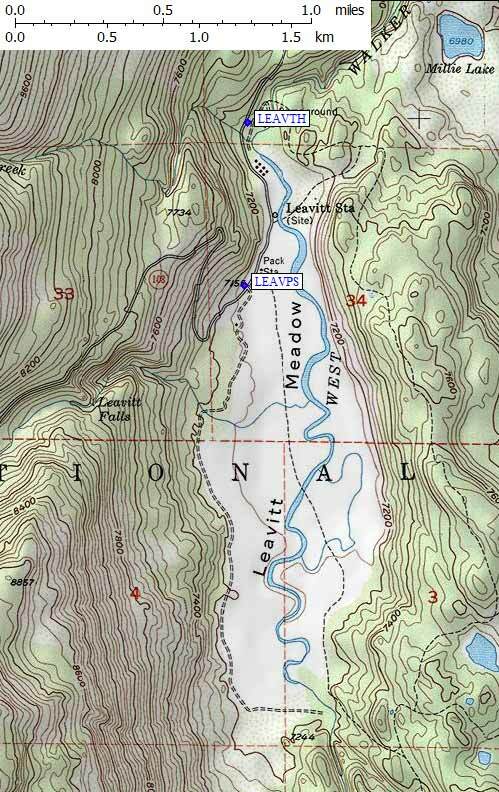 The Leavitt Meadow hiker trailhead (waypoint LEAVTH) is half a mile north (east on Hwy 108) from the pack station parking lot. It's a longer walk but there's a good trail and a bridge here. The parking lot is next to a campground and toilet. Just past the Marine base (shown as 'Landing Strip' on the map), about 5 miles from Hwy 395, there is a winter closure gate (waypoint SPGATE). There is room to park and it appeared to be free and legal for overnight parking in 2011, but check carefully for signs and don't block the gate. There are other, higher, gates but this is the main one that closes the pass mid-winter. This gate is at the west end of Pickel Meadow, where Poore Creek joins the West Walker River.